Will these controversial investments stabilize under Republican rule? The two big gun stocks, Smith & Wesson (NASDAQ:AOBC) and Sturm Ruger (NYSE:RGR), went on a wild ride over the past 12 months due to mass shootings and threats of tighter gun regulations. Smith & Wesson surged from a 52-week low of $18 to a high of $31, then tumbled back to the low $20s. Ruger hit a 52-week high of $78 back in April, but plunged to a low of $47 before rebounding to the low $50s. Those wild price swings likely spooked some investors, but it makes sense once we evaluate the politics and emotions which have fueled gun sales over the past few years. Let's discuss how these factors will come into play next year, and how they could impact both gun stocks. The main thing to remember is that fear of new firearm regulations drove gun sales growth under the Obama Administration. The rash of mass shootings over the past several years exacerbated those fears, causing NICS background checks for firearm purchases to rise year-over-year for 18 consecutive months. 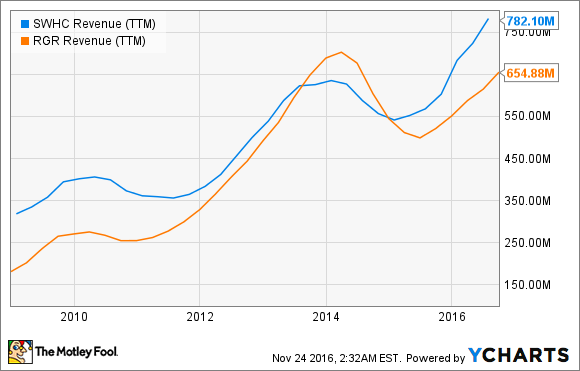 We can see that panic clearly reflected in Smith & Wesson and Ruger's revenue growth over the past eight years. But with Republicans now controlling the presidency and congress, concerns over new regulations will wane and panic purchases will cease -- resulting in much tougher year-over-year comparisons for both Smith & Wesson and Sturm Ruger. That's why both stocks plunged after Trump's surprise victory on Nov. 8. Analysts expect Smith & Wesson's revenue to rise 26% this year but grow just 1% next year. Ruger's revenue is expected to improve 13% this year but fall 14% next year. Therefore, investors shouldn't expect shootings or other tragedies to cause either stock to spike as they did in recent years. However, many lawmakers are still trying to pass more bans on assault rifles -- the weapons which were used in the Newtown, Aurora, and San Bernardino shootings. Seven states (California, Connecticut, Hawaii, Maryland, Massachusetts, New Jersey, New York) and the District of Columbia have banned assault weapons, while Minnesota and Virginia actively regulate their sales. However, Massachusetts attorney general Maura Healey told The Guardian that while these state governments banned sales of assault weapons and their "copies," gunmakers took "it upon themselves to define" what "copies" actually were. Healey claims that loophole enables gunmakers to sell state-compliant "copycat versions of their assault weapons" with "small tweaks that do nothing" to limit their lethality. Tighter state-level restrictions on assault rifles would hurt Smith & Wesson more than Ruger, because the former produces more of those rifles than the latter. In August, Smith & Wesson reportedly donated $500,000 to the National Shooting Sports Foundation to fight Healey's proposals for tighter regulations. It might seem unlikely that the Trump Administration will increase gun regulations, but the President-elect has flipped on the issue before. Back in 2000, Trump supported banning assault weapons and extending waiting periods on gun purchases. But during his presidential campaign, he pledged to undo President Obama's executive gun control orders and called for the elimination of all "gun-free zones" at schools. However, Trump's recent reversal on several key issues has cast some doubts on that hard-line pledge. Either way, if gun owners believe that the gunmakers are willing to work with the government to restrict gun ownership in any way, boycotts will likely follow. Back in 2000, Smith & Wesson signed a historic agreement with the Clinton Administration to enforce safety and design standards, restrictions on magazine sizes, and limits on firearm sales. The NRA immediately called for a boycott on Smith & Wesson products, causing the gunmaker's annual revenue to plummet 37% between 2000 and 2001. Attempts to make guns "safer" with fingerprint activated smart guns have also been frowned upon, since many gun owners believe that adding electronic components to a gun makes them more prone to fail at critical moments. Smith & Wesson has been aggressively diversifying its business beyond guns with acquisitions. Over the past two years, it acquired accessories maker Battenfield Technologies, knife maker Taylor Brands, tactical lights and laser sights maker Crimson Trace, and the assets of survival gear maker UST Brands. Those acquisitions made its accessories division its fastest growing unit last year. Ruger has been less aggressive with diversification, and still mainly relies on its core business of pistols, revolvers, shotguns, and rifles. But looking ahead, both companies could make additional acquisitions (especially in accessories) to balance out their top line growth. If we simply look at valuations, Smith & Wesson and Ruger -- which both trade at 12 times earnings -- look cheap relative to the industry average of 19 for defense products makers. However, investors should remember that both stocks trade more on politics and emotions instead of fundamental growth -- which make them unpredictable long-term plays.